Drop-sequencing (Drop-seq) is a technology developed by the McCarroll lab, Harvard Medical School, Dept of Genetics, to allow biologists to analyze genome-wide gene expression in thousands of individual cells in a single experiment. This work, including the methodology and apparatus used is described in Macosko et al., Cell, 2015. 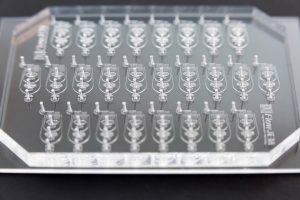 The Drop-seq page on the McCaroll lab website provides interested users with resources to implement Drop-seq in their own labs, by providing details of the latest Drop-seq protocol, including information relating to the unique mixing technology used which comes from V&P Scientific Inc. as well as recommendations on the most reliable Microfluidic Devices capable of producing highly mono-dispersed droplets, such as the design offered by FlowJEM. So where does Web Scientific fit in? 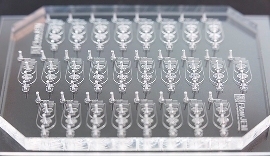 By acting as European & UK distributor for V&P Scientific and FlowJEM, we can supply all of the components required for fluid mixing and droplet generation to allow a successful Drop-seq setup in your lab. Conveniently provides all of the necessary components required for efficient droplet generation in your lab. Not only does this kit make life easier for the end user by allowing you to source everything from one supplier, this kit provides easy access to all of the components recommended in the current McCarroll lab protocol, thereby increasing your chances of success. OPTIMISE YOUR CHANCES OF SUCCESS! FlowJEM’s Drop-sequencing chip offers exactly the same design as detailed in the latest McCarroll lab protocol. 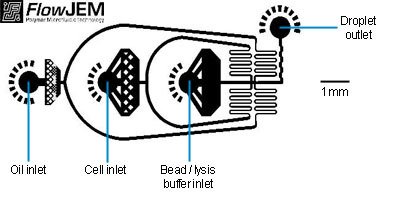 Structure of the Droplet Generation Device showing inlets for oil, cells and beads / lysis buffer and droplet outlet. 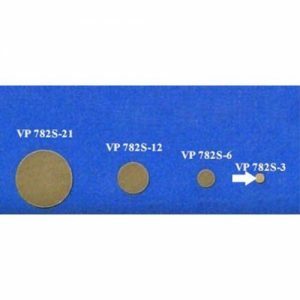 What are the V&P components required? stirrer is both sufficiently powerful and gentle to keep the beads suspended while not breaking them”. Used to position the VP 710D2 Multi Stirrus at a sufficient distance from the syringe pump so as not to interfere withmagnetic stirring. The McCarroll lab uses the Legato® 100 Single Infuse Only Syringe Pump from KD Scientific in their Drop-sequencing experiments. In the interests of making things as easy and convenient as possible, Web Scientific now offers this pump for general sale. The New Era Syringe Pumps, NE-300 (infuse only) and NE-1000 (fully programmable) are much more competitively priced compared to the Legato 100. Although these pumps do not offer the same programming options as the Legato 100 they are both perfectly suitable for delivering the flow rates required for droplet generation. 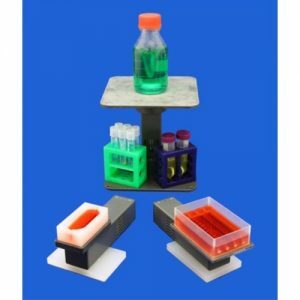 In order to give the Drop-seq protocol the best chance of working in your hands, V&P Scientific have posted a very helpful user note in their user Blog which describes the correct positioning of the Magnetic Tumble Stirrer in relation to the Support Stand to achieve optimum performance. We hope you find this information of value.